Does parenting tire you out and keep you feeling defeated in your desire to raise Christian children? Does the foolishness and bad habits that come out of your children overwhelm you and make you feeling like you are always correcting and scolding them to stop doing this or that? Do you wish that parenting was easier? How was Discipleship: A Character Curriculum Using Scripture created? It started as ‘my solution' to the issues I was facing on that day when the birth of our third child was coming closer and things were getting more challenging. I grabbed the Bible and began typing out scriptures that displayed the opposite of what my children were doing: peace, love, honor, humility and so on. I named the 3 ring notebook ‘the discipleship book' because that was my new focus – disciple my children. Once something poked its unwanted head in our home, I would simply say, “Get the discipleship book and write on (whatever needed to be worked on)”. As the days went by, the discipleship was being used less and less and parenting had less challenges, while my children were showing more Christian character. 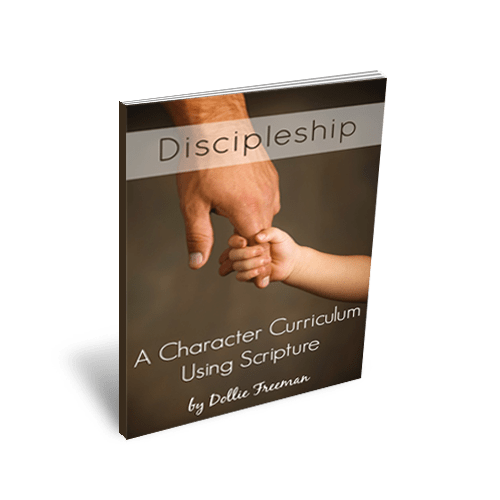 What is Discipleship: A Character Curriculum Using Scripture ebook? Discipleship: A Character Curriculum Using Scripture is a one, two or three year curriculum geared toward children who are learning to write and all the way to a high school curriculum. Each year curriculum has assignments for a 5 day week, however if you desire to take longer with this curriculum, just turn it into whatever year curriculum works for your own family, by just crossing off the assignments when they are done and finish it when you finish it. If you use it for a one year curriculum and do all of the assignments, you can give a high school curriculum to your child. What Assignments are Included in a Discipleship: A Character Curriculum Using Scripture ebook? The ebook consist of 12 character that all Christian parents desire to have their children learn how to portray in their own lives. In order to help this curriculum become part of their life through the assignments there are 5 different things that are done throughout the curriculum that will focus on discipling your children. Copywork – Each of the 12 characters have key verses that have copywork for beginning manuscript and cursive that can be traced and then manuscript and cursive that can be printed ad the child can copy onto another piece of paper. These verses and character definitions have their own printable cards that you can put into a card box for easy review and memory work. Word Study – In addition to memorizing the key verse and definition for each character, there is a printable notebook page for additional word study in scripture for the child to find other relevant verses, using a concordance or online Bible, like Biblegateway, that have the character in the verse. At the end of each character, the child is asked to write a narration on what they have learned about the character. Personal Journal – Depending on the year curriculum you use, the child will add a personal thought about what is in their heart on the printable personal journal notebook page. Prayer Journal – Using word study for prayer, the child will learn what scripture says about prayer, how to pray and using the printable prayer journal pages, they will write down their prayers and mark when answers are received. Reading Log – As word studies are being done for both character and prayer, chapters are being read throughout the Bible. The chapters are added to the reading log, so they can easily keep track of where they are reading. You can also add books about your doctrinal beliefs if you desire and add it to a printable reading log page as well. We did this for high school years only. Scripture is important and using the translation that fits your family is as well. You can choose to purchase the King James Version (KJV) or the New International Version (NIV). If you desire to do a cross reference to how the verses are written and compare them for deeper vocabulary lessons for older children, I also make it available to buy both versions at a discounted price than if you purchased them separately. Would you like to use this character curriculum in your co-op or classroom? If so, you will need to purchase the Group License to teach up to 15 children with each purchase. This is available for either the KJV or the NIV.